Interested in trying Richie Bulldog Certified Hustle Butter Deluxe 2-in1 tattooing lubricant and tattoo aftercare cream, but not ready to invest in a 5oz tub, If so, then these single .25-oz. packets of Hustle Butter are just what you need! Whether you're a tattoo artist interested in learning about the benefits of this 2-in-1 lubricant and tattoo aftercare cream first-hand or you're a tattoo collector who wants a few packets of this premium aftercare product to take with you when you're on the go, you're sure to love these convenient .25-oz. 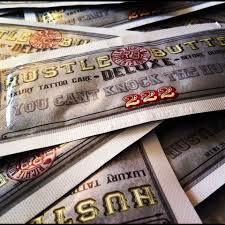 Hustle Butter Deluxe packets! What's so great about Hustle Butter Deluxe? It's a premium, 100%-natural, vegan-friendly tattooing lubricant and tattoo aftercare cream in one convenient product. Hustle Butter Deluxe is made from the finest natural ingredients, including papaya, mango, coco, and other Shea butters. Tattoo collectors love it because this all-natural, vegan-friendly tattoo aftercare cream heals on contact, keeps tattoo-damaged skin moisturized, and heals tattoos beautifully. You'll want to have some with you at all times while your tattoo is healing, which is why we offer these convenient, pocket-sized .25-oz. Tuck a few in your purse or pocket, car, desk drawer, and other spots where it'll be handy whenever you need to apply more. Tattoo artists love Hustle Butter because it goes on smoothly without affecting their stencils, plus it won't goop up like petroleum-based products, it doesn't clog tattoo tubes, and it causes zero distortion while you're working, so you won't over-apply highlights and you'll be able to clearly see your design as you work. Richie Bulldog Certified Hustle Butter Deluxe is THE tattooing lubricant and tattoo aftercare product to use.